"The King's orders are absolute. Fail to obey, and you will be punished." 30 years ago in the remote Yonaki Village, a black envelope is delivered to a single villager. The command inside threatens to draw the entire population into a terrible tragedy! Take a deep breath, steady your heart, and prepare for a shocking, terrifying survival horror adventure! 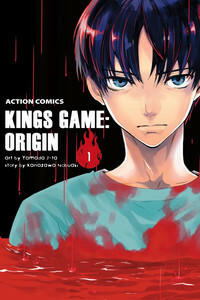 The latest chapter in the wildly popular "King's Game: Origin" saga has begun. It all starts here!